First, I want to see what the buylist price becomes. I respect the ability of people on eBay to get a price during a spike, but it’s been my experience that if you don’t ride that increase immediately, it’s very difficult to get the price you’re hoping for. When the buylist goes up, though, that means the vendors have sold out of a card and are incentivized to restock with the new price in mind, not the old price. Second, I want to figure out if this new price is the plateau, or if the card is too likely to be reprinted for my comfort level. It’s true that nothing is safe, aside from the Reserved List. There are only so many reprints that can happen though, so I want to take it all into account before I get in on a card. With these points in mind, let’s look at some recent jumps in price for a range of cards. Thalia, Guardian of Thraben ($15): She was available in this form at sub-$10 at the beginning of summer, but she’s due for a price correction. Even the Humans deck that took down the SCG Open last weekend is just proving the point: This is a card to be reckoned with. She’s only got one toughness, but she is capable of slowing down the best strategies in both Modern and Legacy. She’s buylisting for nearly $10, and that’s a good sign for her price. I am expecting her to break $20 before long, just off the growth of builds that deny your opponent the chance to do things on curve. 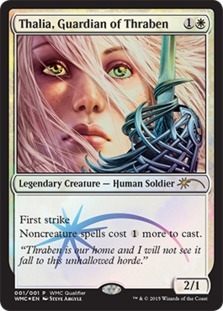 Keep in mind that she’s a small-set rare from six years ago, and her only additional printing was the WMCQ qualifier promo, one of the more iconic images you can have on a card. There’s been few enough cards with this much face on them (Blood of the Martyr) and it lets this version really feel unique. I think she’s going to get reprinted soon, though, and that’s going to kick the legs out from under her price. To be clear, I think ‘soon’ means that I don’t think she will avoid a reprint between the next Commander set or the first Core set next summer. You’re going to walk a fine line if you’re holding copies: You want to hold until she gets the price you desire, but you also have to not hold too long, else the reprint announcement will torpedo the value. 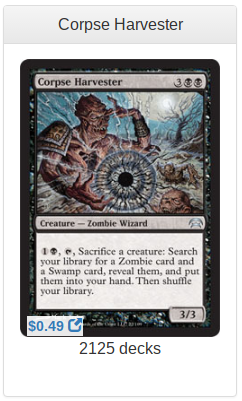 Corpse Harvester ($4): We’ve had some odd spikes in price lately, and this one is likely just due to the supply. This was an uncommon in Legions, and a one-of in the original set of Planechase decks. This means it hasn’t been printed in 8 years, and it’s a card that will take over a game if not dealt with rapidly. It’s a star in one of the most popular tribes (Zombies) and frankly, the reprint risk is through the roof here. Couple thousand people have the right idea! The buylist prices haven’t caught up to TCGplayer yet either, and so I don’t think this new price is going to hold for long. If you can sell these on eBay for $2, go for it, but I hate selling singles at such a low price, it’s just not worth the time involved. Aura Shards ($17): This was about $10 until the GW Commander deck landed, and was one of the first cards people wanted to add to that deck. This is a tremendously powerful card in Commander, but has only had two printings, one from the first Commander release in 2011 and the original printing in 2000. Combine that low supply with the very solid demand, and you have a card that deserves its price. The buylist is solid at $10-$12, but this is another card that wants a reprint desperately. A lot of cards want to be reprinted, but Wizards won’t get to all of them. I don’t think this gets reprinted soon, but the risk is real. I can’t imagine this being uncommon again, this feels like a Modern Masters 2019 rare. Kitchen Finks ($14): This isn’t a spike but this is a card that comes to mind when I think of long-term risks and holds. It was a $10 uncommon, and then printed in the first Modern Masters, and that’s it, aside from being an FNM promo some time ago. Wizards put this card into a set that had almost no other persist cards, indicating that they are winning to pop this into whatever set might need a strong midrange assist. I highly doubt that this would be put into Standard again, though. I would place this about a medium risk for a reprint–it’s one of the most commonly played creatures in Modern, in the sideboard if not the main. Thought-Knot Seer ($8, but $35 foil): We’ve had the price of the foil go up recently, but the original hasn’t gone up much yet, and it’s due to correct upward. This is one of the best creatures in Modern, and as a small-set rare, the supply is relatively small. Keep in mind that sales of this set were during ‘Eldrazi Winter’ and a time of depressed Magic sales. I am cautiously in on TKS. I think that the colorless mana symbol as a casting cost is going to require a lot of support, even in something like a Modern Masters. I suppose they could put this in on its own, but without help (Talismans, painlands, something!) it’s uncastable in a limited format. If you have some, I’d say hold. The correction to above $10 is coming soon, and I fully expect that when the price rises, it’ll get to $15/$45. Scapeshift ($56): This was $20 a couple of years ago, but spiked around Oath of the Gatewatch’s release, and has come up from $40 around the time of Kaladesh. The deck is real, in Modern. Get to a critical mass of lands in play and then fire this off and end the game with Valakut, the Molten Pinnacle triggers. This has been printed once, and the buylist is a solid $30-$35. It’s dodged reprinting so far, but sooner or later, it’ll be printed and the price will dive significantly. There’s no auxillary demand boosting the price, and being printed in modern numbers will saturate the market. I would get out of these if I were holding, as I just don’t like holding cards this expensive and this deperate for a reprint. Cliff has been playing magic since late 1994 and writing about Magic: The Gathering finance since 2013. 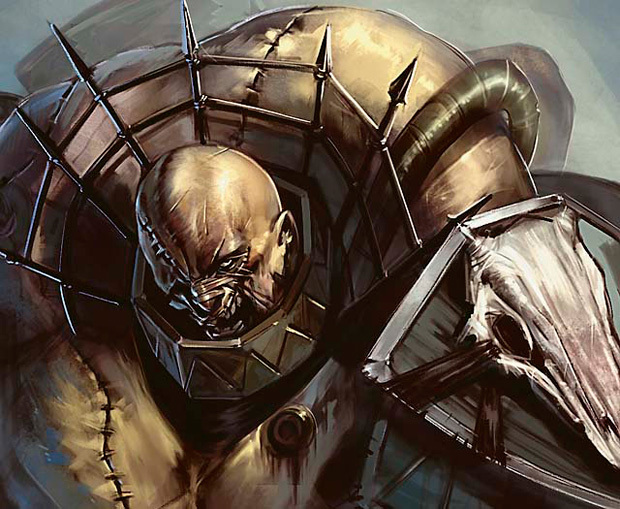 Cube has become his favorite format, but unusual decks of any format will always catch his eye. Follow him on Twitter @wordofcommander or catch his weekly column here on MTGPrice.